You Cast a Spell on Me! Hope everyone is having a great weekend! 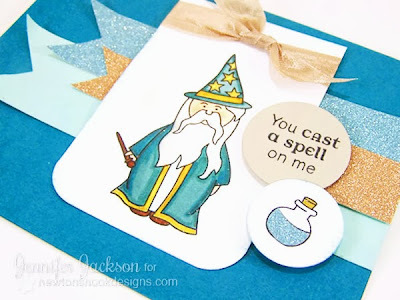 Today I'm sharing a wizard card I made using the Magical Dreams stamp set! I colored this fun guy with copics and added him to this blue card with some sparkly glitter paper in blue and copper! I also paper pierced the "potion" with the blue glitter paper. This one looks so much "sparklier" in person... he he he. But I love how it turned out. This wizard is so much fun to color! I think this would be a great card to send anyone - it could work for almost any occasion! 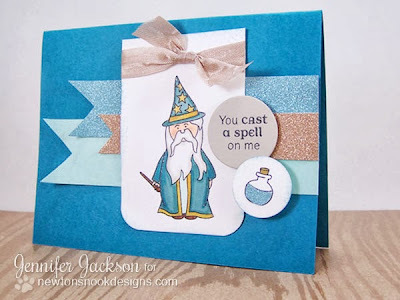 Wonderful wizard! I admire your Copic colouring skills; certainly a technique that i need more practice with (perhaps more copics would help, but...). The glittery paper, colours, layout: you're right - a card for any occasion! Thanks for sharing! Wow the colouring, vivid blues and glitter paper is really amazing on this card.